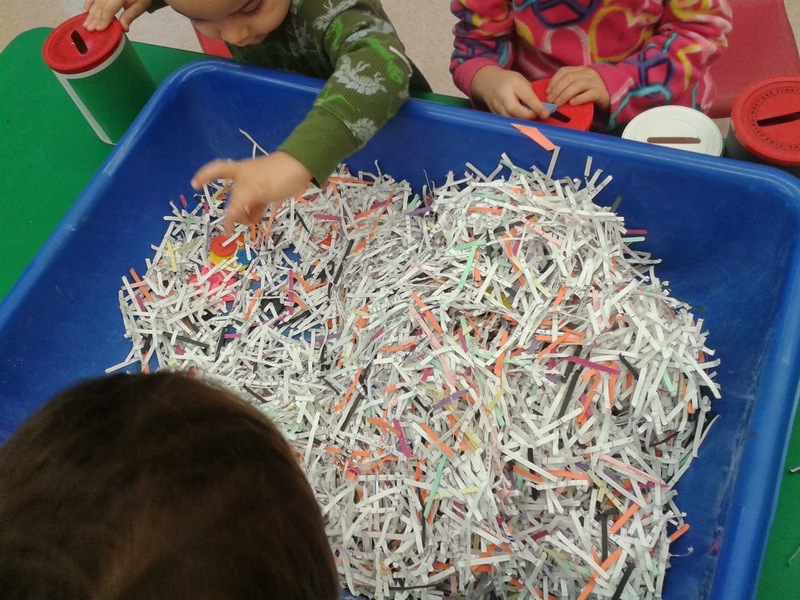 Teach Easy Resources: 3 Center Time Activities to Add to your Repertoire! 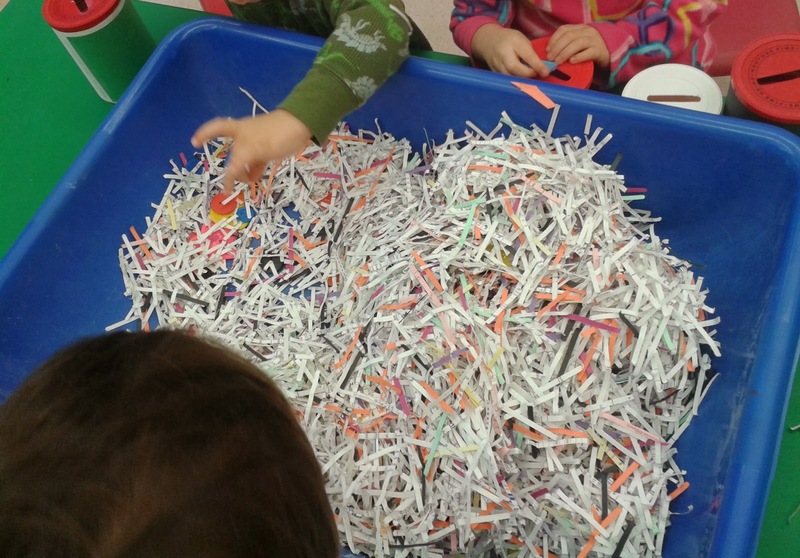 3 Center Time Activities to Add to your Repertoire! We are always creating new center time games to challenge the students and keep them engaged during our free play period. Hopefully you'll find some new ideas here that you may like to try, too! In the past week, we added shredded paper to our sensory bin and then "hid" our collection of plastic multi-colored buttons underneath. The students search for the buttons, and when they find one, they drop it into the canister of the same color. Not to mention the piggy bank connection. Who doesn't love dropping coins into a piggy bank?! If you don't have enough cans for all of your button colors, just double up the colors on one can. You'll see I did that with red and black on the can in the photo. Doubling up also saves on storage space! If you want to save even more storage space, use a variety of can sizes so that you can stack them one inside another when not in use. 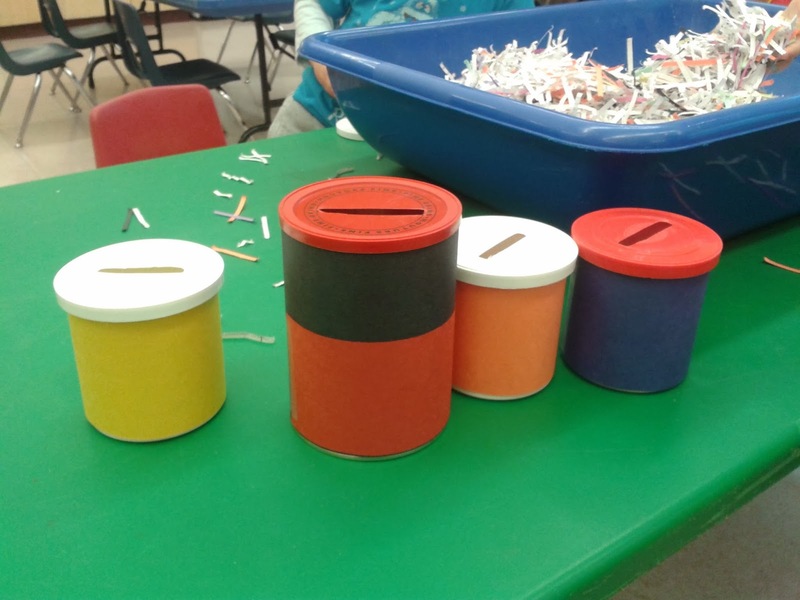 Another center activity that has been popular with our class is a fine motor activity for which you'll need toothpicks (preferably colored), and a little spice container such as the one in the photo. This idea was brought in by my co-teacher. I believe she purchased the the plastic spice container at the Dollar Store. 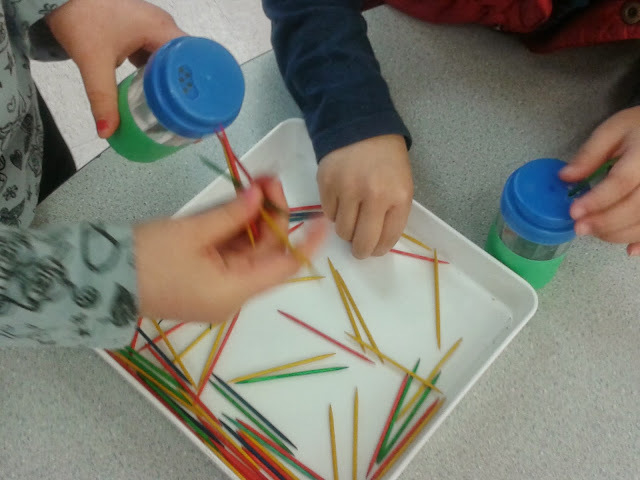 The children pick up the toothpicks and insert them one by one into the tiny holes. 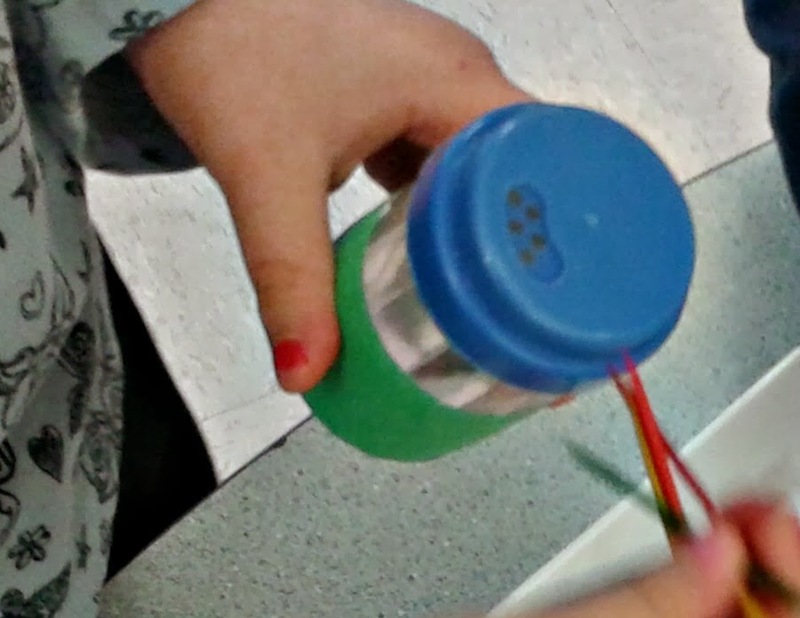 When all the toothpicks are inside the container, the students can twist off the lid (another great skill to practice!) and dump them back out for the next person. If you want your students to practice counting, one option could be an activity similar to my Cupcake Candle Count game below. 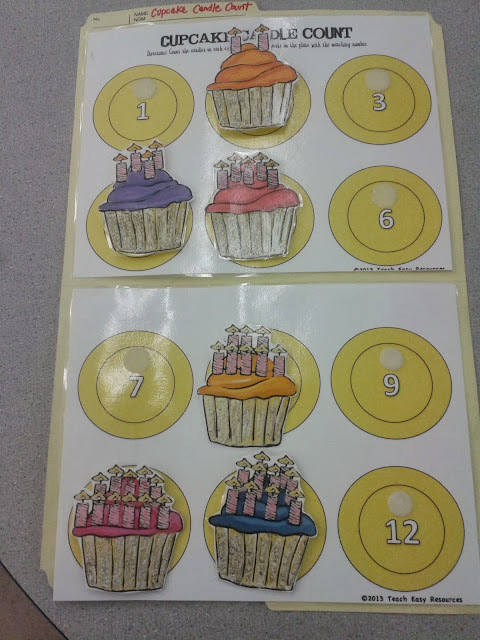 The children count the candles on the cupcakes and then place them on the plate with the corresponding number. When all the cupcakes have been placed in their spot, we often sing the Happy Birthday song and pretend to blow out the candles. I added a dot of peel and stick velcro to the back of the cupakes and then to the plate to add to the fun. It's much more satisfying to play this game when you can stick and unstick the cupcakes with the velcro! We have a wooden tray from an old Melissa and Doug puzzle that we use to hold the pieces for games such as these so that they are kept orderly (and from falling off the table!) while playing. 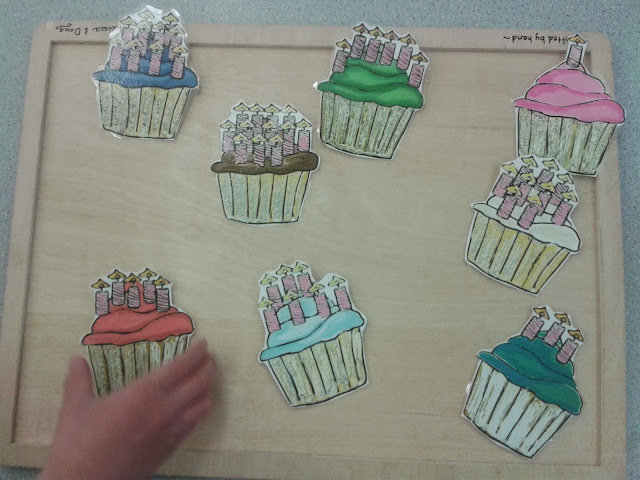 This Cupcake activity is part of my Cupcake Crazy Unit which features a number of colour and number games. If you like this game and want to save yourself the time of making it, you can check out the unit HERE. 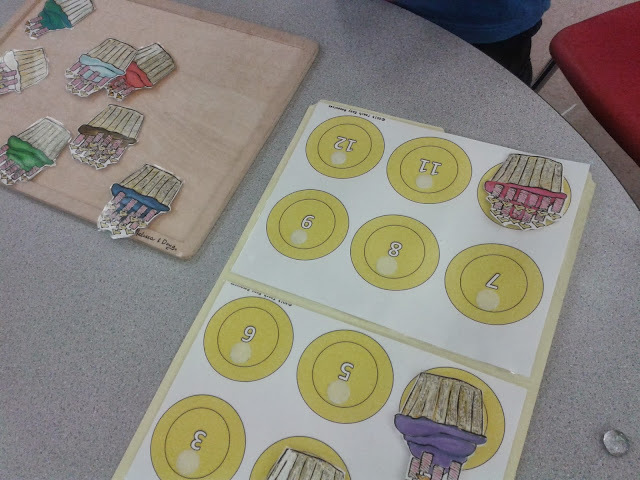 It contains a number of different activities, songs, and felt board stories to teach colors and numbers. I hope this post gives you some new ideas for your class.